The Aesthetic Treatments Diploma is a Level 3 international qualification focusing on aesthetics. This diploma is approved by CIBTAC and is recognised internationally by over 30 countries. 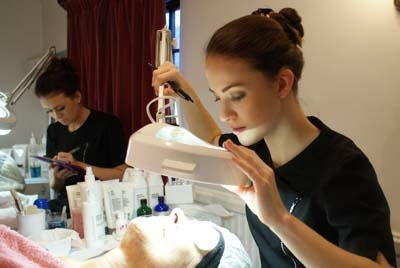 Students will be able to perform safe and effective facial therapy, make-up, hand and foot and waxing treatments. Diploma will enable the candidate to gain employment as an aesthetician. Attendance Part time: Tuesday all day, Wednesday afternoon & Thursday afternoon. Recognise skin types and disorders and take appropriate action in selecting or advising clients about treatments and aftercare. Adapt treatments to suit the individual client’s needs by analysing information gathered at consultation, including contra-indications. Select, use and advise clients about skin care products and make-up for the face, and products for the hands and feet. Understand the basic key ingredients in cosmetic preparations. Understand the scientific principles of electrotherapy applied to the face and neck area. Understand the importance of current local legislation appertaining to beauty employment. Excellent communication, listening skills, a well-groomed appearance and a mature disposition is an asset. Aromatherapy – A healing system one cannot do without!